Dak'Toká Taíno (I am Taíno): A personal search for my Taíno roots and how it evolved into activism thru film. September 2017 – Hurricane María hit Puerto Rico and destroyed homes, plantations and 3,000 people died. I was devastated because food and other necessities weren’t arriving to remote mountainous areas. I knew then that something was very wrong. I saw that must of the help we weren’t getting was due greatly because of our colonial status and old laws that keeps Puerto Rico subdued to the United States. The film aims to reveal our Taíno culture but at the same time it creates awareness of the colonialism structure we were put in. I am hoping to inspire our people, my Borikén brothers and sisters to come up with solutions and shape our own destiny and give the new generations the tools to keep moving Puerto Rico forward. 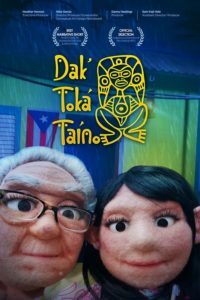 Dak’Toká Taíno, (I am Taíno) is a live-puppet short about the aftermath of hurricane María in Puerto Rico and how grandma Yaya helps her grand-daugther Marabelí understand their history, their Taíno indigenous culture and how to cope under the desperate situation they are in. In the film grandma teaches Marabelí a Taíno prayer and it also teaches the little girl that we can prosper using old Taíno technology of protecting the earth and sustainability plus using new ways to plant for the future of our island Borikén (Puerto Rico). I draw from my experience of having two grandmothers or aracoeles, that were Taíno and in my childhood memories of learning from them in the mountains of Borikén. Alba Enid García is an international award winning Puerto Rican director, of Taíno indigenous descend, she is currently working on her 4th film Dangerously Ever After, a stop-motion film based on the award winning picture book of the same name. This book was written by Dashka Slater and Illustrated by Valeria Docampo. Alba just completed in the summer of 2018 her new short film Dak’Toká Taíno, (I am Taíno) a Taíno inspired live-puppet short. Dak’Toká Taíno, is a story about the aftermath of hurricane María in Puerto Rico and how Abuela Yaya helps her grand-daugther Marabelí understand their history, their Taíno indigenous culture and how to cope under the desperate situation they are in. Heather Henson from IBEX Puppetry is the Executive Producer for this film along side Sam Koji -Hale. Danny Hastings from ATOMICUS is a Producer for this film. Alba is a master sculptress, writer, designer. Her art creatures dolls are in private collections all over the world. Alba is a member of the Association International Du Film D’Animation and Women in Animation. Alba opened her FANTASIATION Studio in the Summer of 2008. She graduated from the University of Puerto Rico achieving a Fine Arts B.A. Degree, she completed a stop-motion Film at the School of Visual Arts, NY, year 2000 achieving the Dusty Film Festival Award for her stop-motion animation, The Happy Prince, by Oscar Wilde. She worked at Celebrity Deathmatch, MTV., as an Animator. Her film Time Space Reflections won International Film Festivals all over the world 2014-2015.